The visitors didn’t rest on their laurels, and when an attack down the right found Tom Hitchcock, he composed himself to finish well and double the lead. Tom Hitchcock nearly added to his tally when he caught Burgess Hill ‘keeper Josh James off his line and although he rounded the stopper, his shot from outside of the box crept past the post. Harlow Town had the width of the post to thank when Burgess Hill were denied pulling a goal back. Smith-Joseph’s effort was deflected wide, and from the resulting corner the shot cannoned off the inside of the post before eventually being cleared from danger. With half-time approaching, the Harlow Town were given the opportunity to add another. Tom Hitchcock was felled in the area, and Matt Foy sent the goalkeeper the wrong way to put the Hawks three up going into the break. 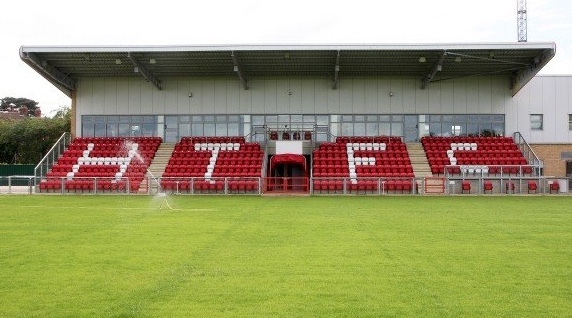 It was the turn of Harlow Town to hit the woodwork when a cross in from Taylor Hastings was met by Matt Foy, but he was denied his hat-trick by the frame of the goal.